The three-dollar gold series is one of the so-called “odd denominations” of United States coinage. First issued in 1854, the denomination was soon deemed obsolete and, despite the fact that they were issued in both Proof as well as Uncirculated format until 1889, circulation was minimal. When first released, these coins were meant to facilitate purchases of 100 count sheets of stamps, with the first-class rate at the time being three cents a piece. Over time postage rates changed, however, and few of today’s non-collectors have even heard of such a thing as a three-dollar coin. Yet there are some dedicated collectors to the series, and we will take a look at some of the key dates of unique denomination. The 1854-D three-dollar gold piece is the only coin of this denomination struck at the Dahlonega Mint. With a mintage of just 1,120 coins, this is the key date of the series (except for the unique 1870-S, see below) and demand for it is high. This must have been noticed early on, as quite a few circulated examples are known in relation to the low mintage, with approximately ten percent of the original total still in existence. Higher circulated grades are rare, however, and Uncirculated coins are prime rarities. 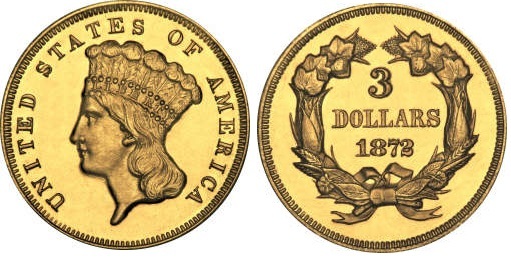 Quality control at the Dahlonega Mint was virtually non-existent at the time, and virtually all 1854-D three -dollar gold pieces will show striking weakness, and overall eye-appeal is lacking. Only about half a dozen Uncirculated pieces are known in the lower Mint State grades. The sole three-dollar gold piece from the New Orleans Mint was also struck in 1854, but this issue is not nearly as scarce as the Dahlonega issue, especially in lower grades. Mintages for three-dollar gold pieces at the San Francisco Mint were small, and the denomination was produced for a limited number of years. While circulated pieces are sometimes encountered, both the 1855-S and 1857-S issues are extremely rare in Uncirculated condition, with perhaps two or three known for the 1855-S. This is not a surprise as, with mintage of just 6,600, there weren’t too many coins to begin with. There has not been an Uncirculated example offered at public auction in recent memory, and this is one of the true key dates of the series. The undisputed key date of the series is the 1870-S, with only a single known example, residing in the Harry W. Bass, Jr. Collection on display at the American Numismatic Association in Colorado. Presumably two pieces were struck, one of which was placed in the cornerstone of the new San Francisco Mint in 1870; the other eventually ended up in the Eliasberg and Bass collections. It is unlikely that any more will be found as the Superintendent of the San Francisco Mint in 1870 claimed only a single piece had been struck. The San Francisco Mint had not struck three dollar gold pieces since 1860 and the 1870-S is a rather crude product, with the “S” mint mark cut into the die by hand and the numerals 893 scratched in the coin. In the literature the coin is generally graded XF details. Despite all this, it last sold in 1982 for $687,500 and presumably is worth many times that amount today. With few exceptions, mintages of three-dollar gold pieces dropped considerably after the Civil War, but totals of around 1,000 to 5,000 coins are not unheard of. Of these, the 1877 is the rarest issue, although its mintage is not the lowest at 1,468 business strikes and 20 Proofs. Most likely the business strikes were quietly released into circulation, as today this is one of the rarest three dollar gold pieces from the Philadelphia Mint. Most pieces that survive today show wear, and Uncirculated pieces are extremely rare. Of the entire mintage, it is estimated that approximately 100 circulated examples survive in addition to perhaps a dozen Uncirculated pieces at most. While the 1877 issue is one of the true Philadelphia key dates, it does not have the lowest mintage of the series next to the 1870-S. That honor goes to the 1881, which saw 500 business strikes produced, with an additional 54 Proofs struck for collectors. Needless to say this issue is rare in any grade, although quite a few of the original pieces survive in Uncirculated condition. This still doesn’t amount to much, however, as the mintage was low to begin with. Some circulated pieces exist as well, and are certified at the upper AU levels. The finest-known is a single PCGS MS-66, but there have been several dozen Uncirculated pieces graded in lower MS grades appraised by both PCGS and NGC. With such low mintages toward the end of the series, there are very few dates for three-dollar gold coins that can be considered common. In the early dates, the 1854-O (mintage 24,000) is available in lower grades, but extremely rare in Uncirculated condition. Its status as the only three-dollar gold piece from the New Orleans Mint has made it a popular coin with specialists. The 1858 Philadelphia issue had only 2,133 pieces struck, but this issue is not very expensive, despite having a similar number of survivors to some of the branch mint issues discussed above. Being struck at the “ordinary” Philadelphia Mint doesn’t help its popularity. As for the later Philadelphia dates, beside the 1881 there are several other dates with mintages of 1,000 business strikes or less. These are the 1880 (1,000), 1883 (900), 1884 (1,000), 1885 (801), and 1886 (1,000). In fact, between 1858 and the end of the series in 1889, there are only three years with mintages above 10,000 pieces. These are the 1859 (15,558), 1874 (41,800), and 1878 (82,304). The latter, in particular, would make an excellent type-coin of this now long forgotten denomination.